The last time Washington, D.C., was under one-party control was at the beginning of former President Obama’s term. As you might recall, generationally significant legislation made it through in the 111th Congress: the Affordable Care Act, the economic stimulus bill—and, not least for bankers, the Dodd-Frank Act. A party with solid control of the executive and legislative branches can get a lot done—good and bad. So President Trump’s win on Nov. 8—despite not having nearly the same advantage in the Senate that Obama had—has many bankers optimistic that, with a healthy dose of bipartisan engagement, 2017 might be the year the industry finally sees needed regulatory relief. During closed-door deliberations this winter, after the election but before Trump took office, banking industry leaders on ABA’s Board and Government Relations Council agreed that the outlook for needed policy changes has improved. They also emphasized the value of the industry taking a larger view about what our communities and customers need to thrive—and not just speak of banking industry-specific concerns. And after a decade of recession followed by persistently sluggish economic gains, the biggest need in America’s hometowns is growth. To that end, bankers have produced a new ABA Blueprint for Growth that prioritizes the kind of policy changes that will deliver sustained growth, which will in turn help entrepreneurs create more and better jobs, families invest in education, young Americans buy homes and neighbors save more efficiently for retirement. And as real growth occurs in both national and local economies, banks will thrive, too. On the economic front, tax reform is one of House Speaker Paul Ryan’s top goals—a white whale he has been pursuing since before he entered Congress. This congressional session is shaping up to be the best shot at overhauling the tax code since it was last accomplished three decades ago under Ronald Reagan. 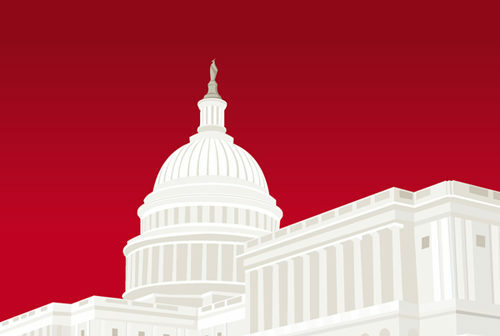 ABA strongly supports a simpler tax code with lower rates and, under the leadership of ABA VP John Kinsella, has convened a tax reform working group to highlight pro-growth tax strategies for Congress, review proposals from Capitol Hill and identify key concerns and priorities specific to banks. This group will continue to meet and provide feedback and insights as the process moves ahead this year. On the regulatory front, House Financial Services Committee Chairman Jeb Hensarling is likely to advance a comprehensive financial regulatory reform package this year. The fate of the bill—a version of which was introduced in the previous Congress and included several provisions strongly backed by ABA—will depend on whether it can win moderate Democratic support on the Senate Banking Committee, says Ballentine. “You can’t pass bills in the Senate on party-line votes,” he explains, since the filibuster remains intact for most legislation and thus 60 votes are required on the floor. Functionally, that requires minority support at the committee level for major bills. However, four Senate Banking Committee Democrats represent states that Trump carried by at least eight percentage points—and all four are up for reelection in 2018, arguably giving them an incentive to work with the Republicans. ABA and banker leaders continue to emphasize the importance of continuing to communicate with Congress in ways that emphasize the value of legislation for customers and hometown businesses and not the banks’ costs or operational efficiency, as important as those are. For example, instead of complaining about the loss of interchange revenue, bankers can talk about how the Durbin Amendment has led to the decline of customer-friendly and popular free checking accounts. And instead of describing the burdens on banks of excessive Bank Secrecy Act customer due diligence requirements, bankers can explain how the burdensome onboarding process frustrates customers, particularly business clients, with the amount of documentation they must produce. Nichols is similarly optimistic about the likelihood of change on the regulatory front. Change of personnel at the independent banking regulators will not be immediate, as the terms of top regulators are somewhat staggered and don’t end when the administration does, but as the Trump team moves ahead with the transition, more pro-growth regulatory agency heads can be expected.